HIV-related deaths and new HIV infections among people who inject drugs could be almost entirely eliminated by 2030 with just a tiny shift in global drug control spending. This is one finding of our report The Case for a Harm Reduction Decade. The study uses data we have collected over the last 10 years for our biennial Global State of Harm Reduction reports to assess progress and reflect on challenges faced around the world. Using mathematical modelling, it then outlines the potential impact of increased investment in harm reduction on avoidable health-related harms associated with injecting drug use over the next decade and beyond. It shows that the redirection of just 7.5% of current drug control spending by 2020 would achieve a 94% cut in new HIV infections among people who use drugs by 2030, and a 93% drop in HIV-related deaths. An estimated US$100 billion is currently spent on global drug enforcement and control, while only US$160 million is spent on harm reduction. Over the last decade, harm reduction has proved to be an approach to drugs that saves lives, saves money, and helps respect, protect and fulfil the human rights of people who use drugs. If commitments can be made to the tiny shift in funding suggested by our report, this year’s United Nations General Assembly Special Session on Drugs could mark the start of a Harm Reduction Decade, and by 2030 we could have seen HIV/AIDS virtually wiped out among people who inject drugs. Right click on the image to save it so that you can attach it to tweets and Facebook posts. $100bn is spent every year on the war on drugs. Redirecting less than 10% of that by 2020 would be enough to end AIDS among people who inject drugs by 2030. 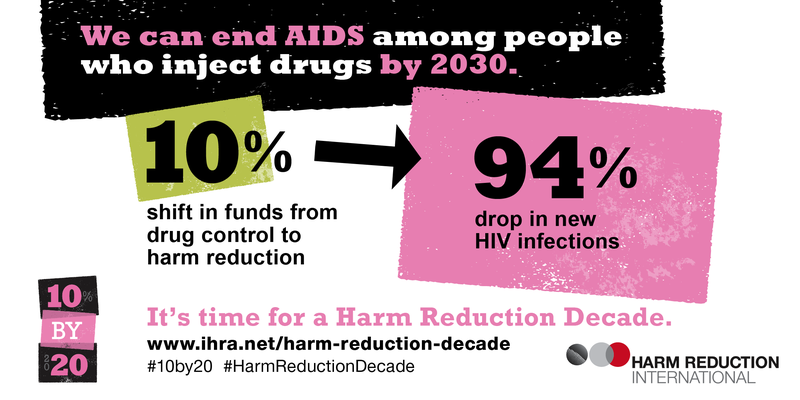 This new report shows how harm reduction could end AIDS among people who inject drugs by 2030, and it would only cost a fraction of the money spent on the war on drugs. Redirecting just a small amount of drug war money to harm reduction could have an incredible impact on HIV rates among people who inject drugs. Find out more about the 10 by 20 campaign.